Last year on this date, India’s Maoist “Naxalites” publicly beheaded a former comrade who had surrendered and collaborated with police. The incident that occurred in village Murgaon of Dhanora sub district has the entire Maoist-affected region in the grip of tension because of the manner in which the reprisal has been carried out. 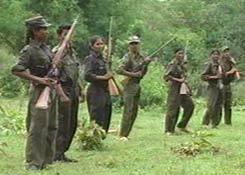 A group of 40 to 50 Maoists went to the village Saturday night, called out Anandrao Sainu Koram from his house, tied him to a tree and beheaded him in full view of the villagers who had gathered at the spot, deputy superintendent of police Anant Rokde said Sunday. “They also warned Anandrao’s colleague Shantaram Gawde, who too had surrendered to the police in April this year along with three others, that he would meet the same fate if he did not desist from acting as an informer,” Rokde told IANS on the basis of the complaint lodged by Anandrao’s wife. The 23-year-old Koram was reportedly the fourth surrendered Naxalite slain by insurgents in as many months of the long-running and escalating conflict … which, needless to say, has been dire for civilians.